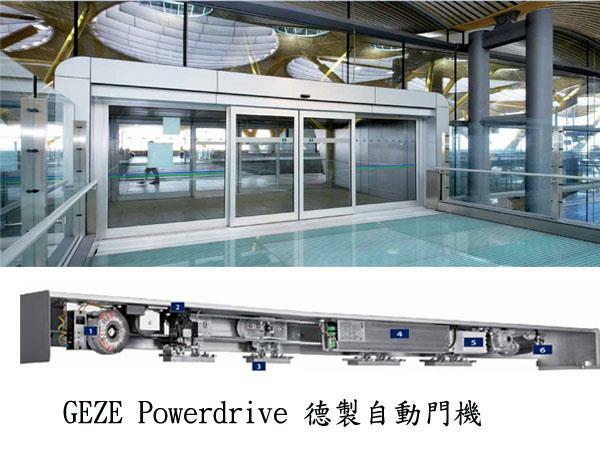 Low noise development and powerful 200 W.
2.Locking system The bistable electromechanical locking system with mechanicalemergency unlocking is continuously monitored by the control and is thus protected from misuse. Optimal sliding characteristics and minor wear due to the coordinated profi les of the roller and track Integrated brushes which permanently clean the rollers(self-cleaning roller carriage) ensure high service life and reduced noise development. The self-learning 16-bit microprocessor control adapts the operating parameters to the environmental conditions and uses CAN bus to communicate with other GEZE products Always up-to-date because of the easy software update possibilities,and well-equipped in control engineering even for future developments. In case of emergencies, the light and compact NiMH battery enables the door to be temporarily opened or closed even without an external power supply. Powerful motor with 400 Ncm and encapsulated gear, low-noise.